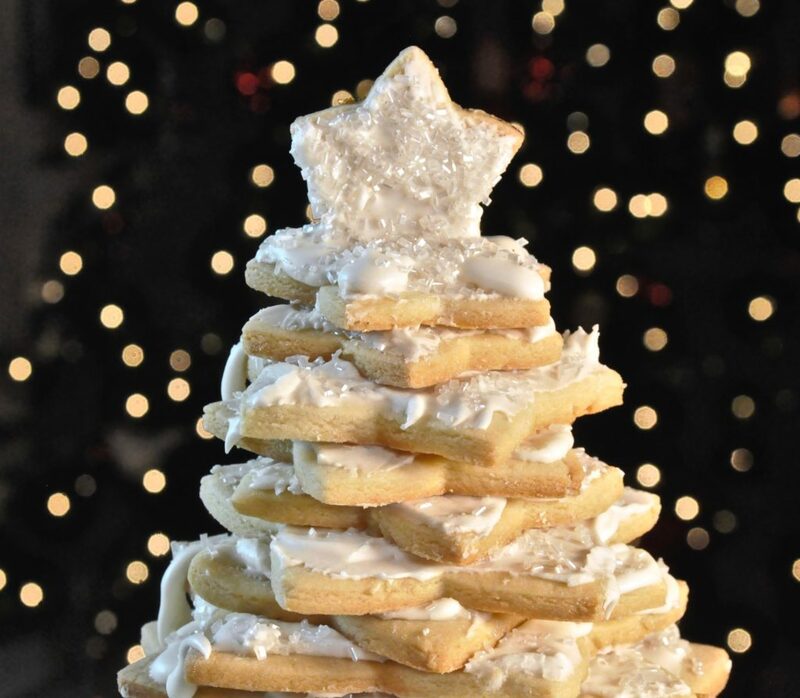 I know you’re all frantically trying to get everything done before Christmas, and may not have time to make this cookie Christmas tree, but you might want to tuck away this idea for next year, especially if there are kids in the family. 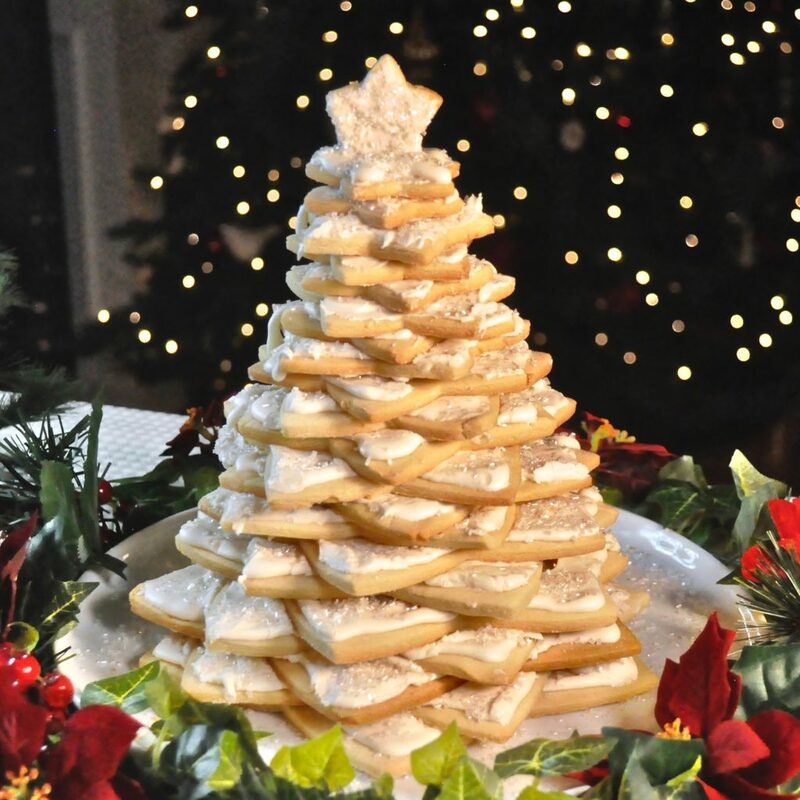 This “Christmas tree” is composed of delicious sugar cookies, covered in royal icing, which acts as a sweet “glue” keeping the tower from toppling over. 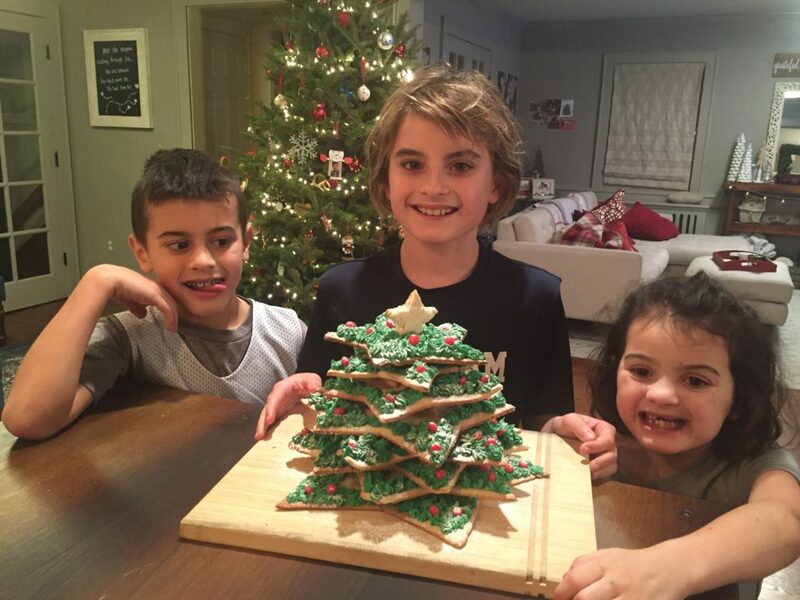 I made a similar tree last year with the grandkids, cutting out templates for each size of the cookie layers with scissors and paper templates. Even though it was a little tedious to cut using a knife around pieces of paper instead of real cookie cutters, it all came together, and they were eager to dig into it, decorated with green frosting and red candies. Here’s a closer look at the layers, which you swivel to alternate the points, as you’re building the tree. The royal icing, made of egg whites and sugar, dries as hard as cement, but you might need to just steady each layer for a moment before moving to the next. Start by “glueing” the bottom layer to the plate so it doesn’t slip. Before you know it, you’ll have a towering edible tree, that adults and kids alike will love. It may be hard to dig in and break up this beauty, but hey, you’ll be making a lot of people happy, and you can always make another one next year. 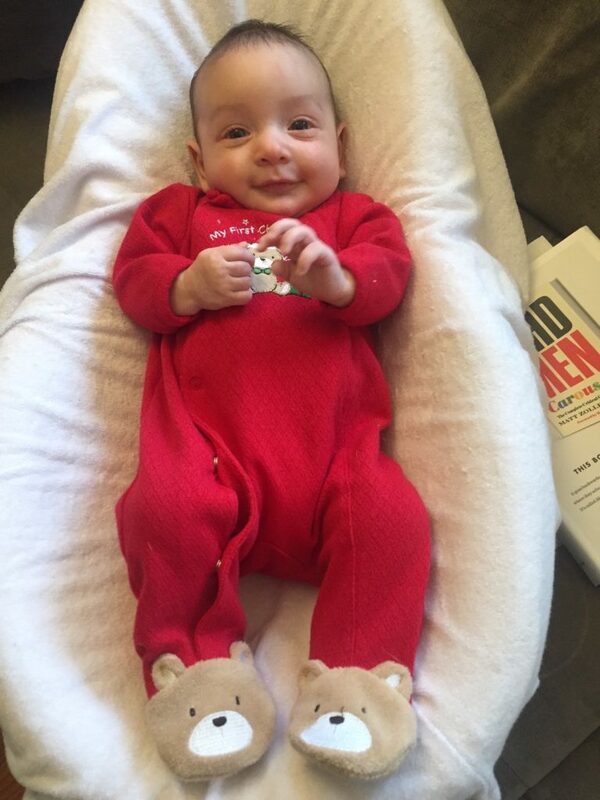 and the newest and youngest member of our family – my two month old granddaughter, Aurelia. And we have another new granddaughter coming any day now, from my husband’s side of the family!! Our family has really grown in the last couple of years. I count my lucky stars every day! I hope you all have a wonderful Christmas holiday too, surrounded by good friends and family. Thank you to all my readers who followed me this year. I really appreciate your support. See you in 2019! Sorry for the formatting of this recipe, but WordPress updated and the icon for the “Easywrite” recipe (that allows you to print the recipe without printing the entire post) is missing. I’ll try to figure it out for the next post, but if any of my readers, who are also food bloggers and who also use WordPress, can clue me in, please drop me a line and let me know. Beat the butter and sugar together at a medium high speed until pale and light, then beat in the eggs and vanilla. Reduce speed to low, then add the flour, mixing until well combined. 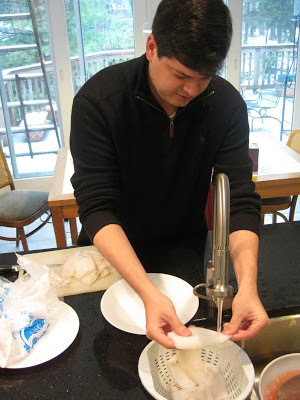 Form dough into four balls and flatten into disks. Keep each disk wrapped for about 1/2 hour or so. Roll out a disk of dough onto a well-floured surface, about 1/4 inch thick. I found it easiest to roll onto parchment paper, especially for the large shapes, so I could easily transfer the parchment paper to the baking sheet without risk of ripping the dough. Cut the largest shapes first, and remove the excess dough from the parchment paper. Set that dough aside to reuse with other pieces later. 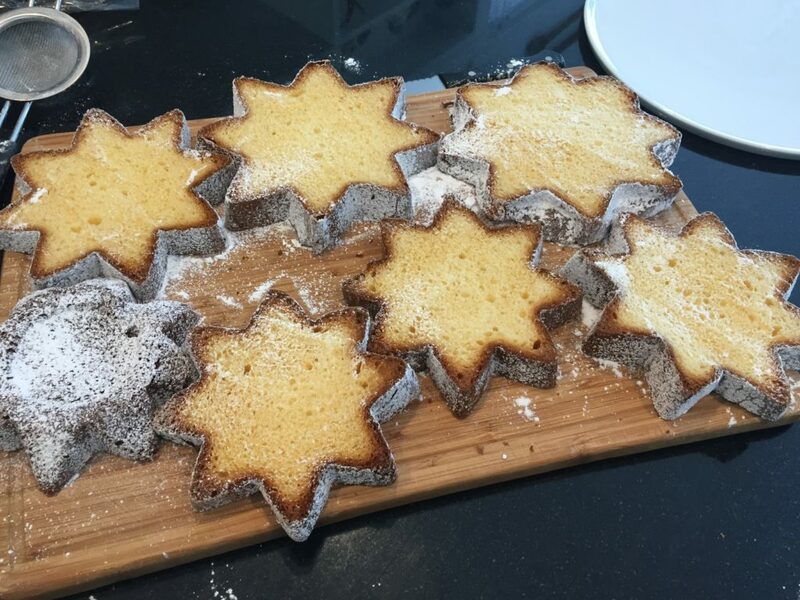 Keep cutting out the stars, using the largest shape cutters two or three times each, and some of the smaller shape cutters two or three times each, until you run out of fresh dough. Make more cookies, gathering the remaining scraps and reroll them, but try not to reroll more than once, or you’ll get a tougher cookie. Bake in a 350 degree oven about 10 to 12 minutes. Whip egg whites until frothy and add the vanilla, then the confectioner’s sugar, 1/2 cup at a time. Beat on high speed until the mixture is glossy and thick. Pipe or spread some of the icing on the plate to secure the first star. Then pipe or frost some of the royal icing on the tips of each layer, sprinkling with decorations immediately. Once the icing dries, you won’t be able to sprinkle anything on top. Pivot the next cookie “star” so that the tips are in a different alignment than the layer below, frosting each tip and decorating with sprinkles. Continue doing the same until you reach the top, saving the smallest star for the top. 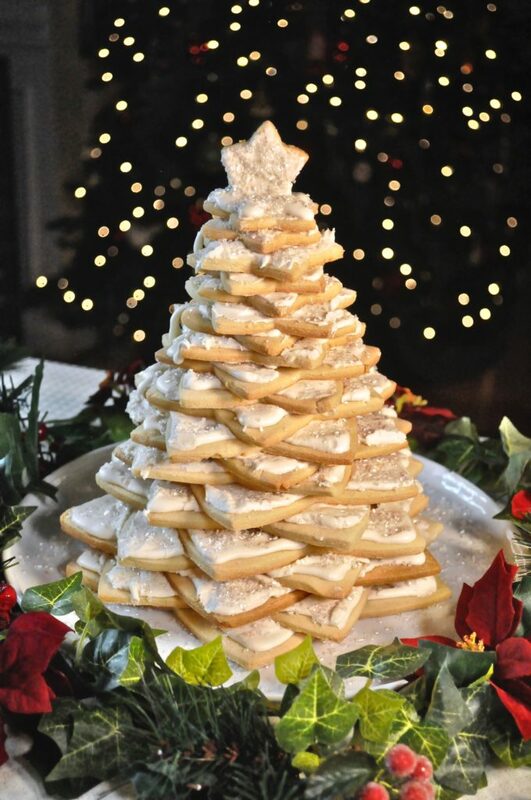 You may have to hold the cookie tree at various levels for a few minutes if it feels like it’s going to topple, until the icing sets a bit. Once the royal icing sets, it is very secure. 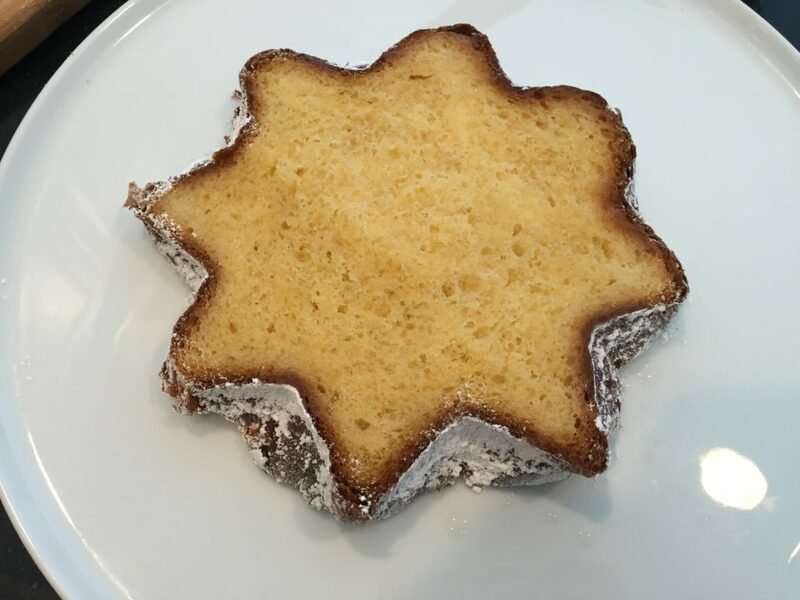 If you follow this blog, you know I’ve posted a recipe for a Pandoro Christmas tree dessert in the past, filled with either a chocolate mousse filling, or a lemon curd/mascarpone filling. You can view it here. 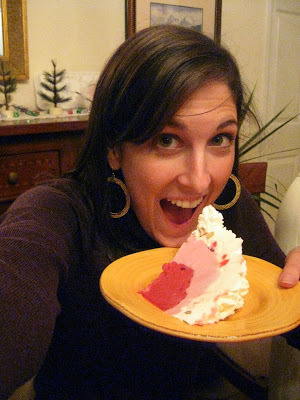 They’re as easy as can be, since the cake itself – a traditional rich, buttery Italian Christmas treat – is purchased. 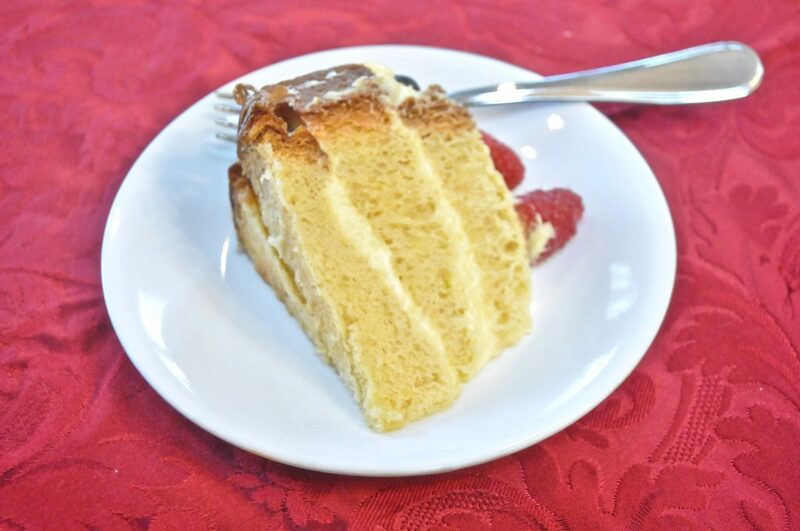 All you have to do is slice it, drizzle it with some liqueur (or a simple syrup), make the fillings, and assemble the cake. Making the filling is the hardest part. But this year, I’m making it really easy on myself with a filling made from whipped cream and a boxed vanilla pudding mix. That’s right, I’m taking a shortcut, and I have to confess, I think it’s my favorite of all the ones I’ve made in the past. After all the work that’s required for the Lucullan fish feast we enjoy on Christmas Eve, this easily prepared dessert is a much needed way to present a delicious showstopper without too much fuss. 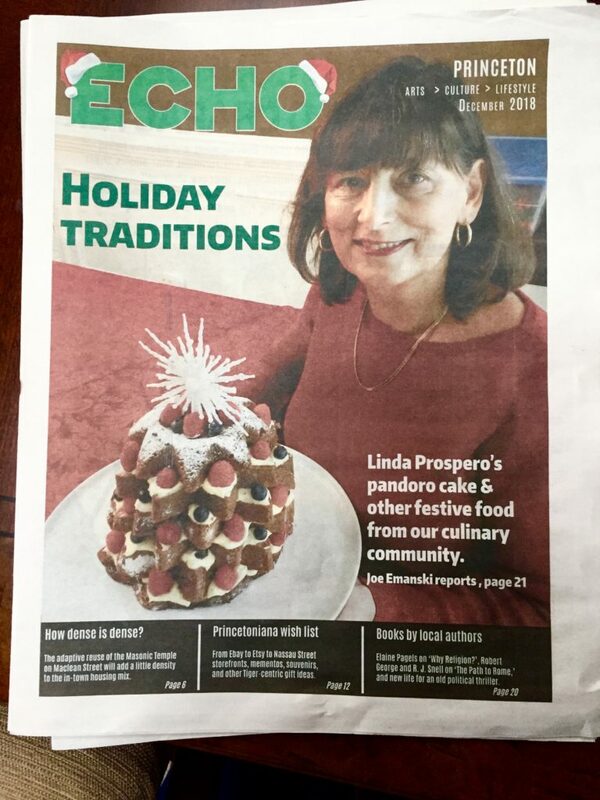 And while we’re talking about Christmas Eve, I was recently contacted by a local newspaper, whose reporter interviewed me for a feature on holiday food traditions. As a former journalist, I’m used to being the one doing the interviewing, but this time the tables were turned and the reporter asked me lots of questions. 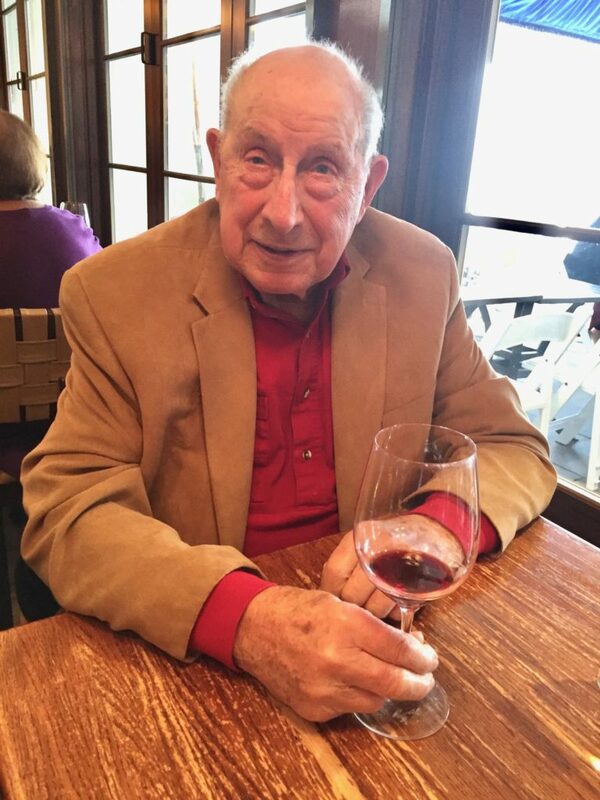 He wrote a really nice article about my family, that includes my recipe for stuffed squid, and a photo of my dad and husband, that you can read here. But little did I know that my photo would be plastered on the front page – bad hair day, wrinkles and all! Where’s Photoshop when you need it? 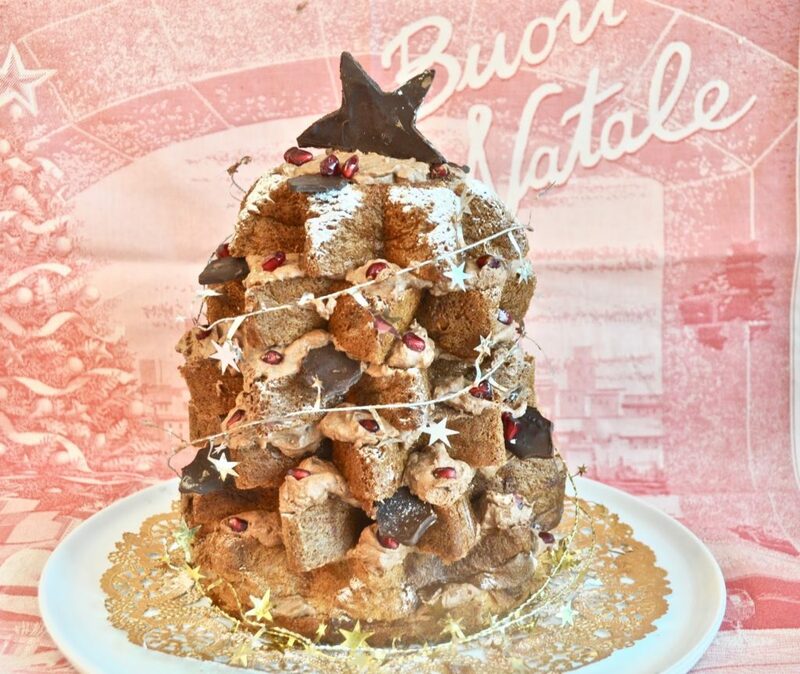 Anyway, back to regularly scheduled programming – and the easy Pandoro Christmas tree. 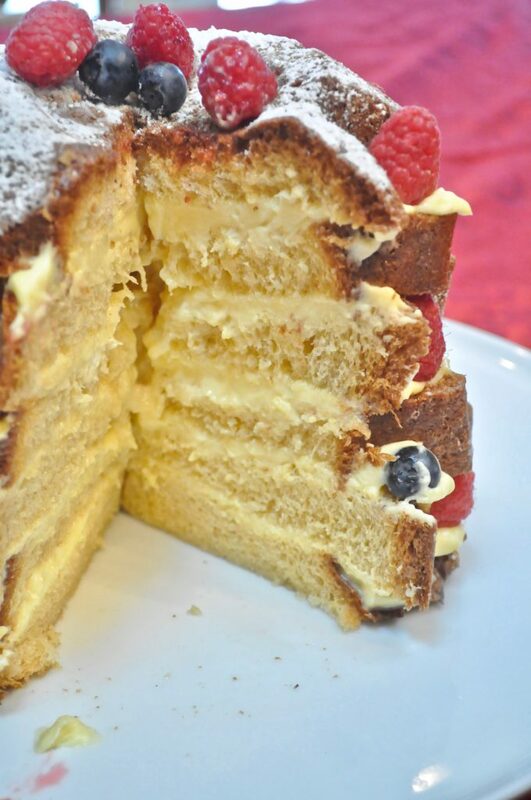 Slice the cake into about seven even layers. If you’re serving it right away, dust the cake first with powdered sugar. It’s easiest to sprinkle on the sugar before you layer it and add the filling, so you can roll it on its side and get better coverage. But if you’re holding it to serve it a day or two later, it won’t matter because the sugar will dissolve into the cake. Make the simple syrup and add the liqueur. I divided the simple syrup solution and in one I added rum. In the other I added Sambuca. I alternated flavors with different layers. If you don’t want to add liqueur, you can just the simple syrup without alcohol. The cake isn’t particularly dry, but I think it really benefits from some moistening, so don’t skip this step. Make the instant pudding mix by mixing milk with the mix (using less milk than the box calls for, since you’ll be adding whipped cream. 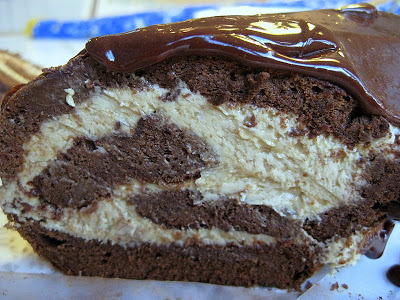 You don’t want it so soft that it pours out of the cake layers.) Fold in the whipped cream. Spread some of the filling on each layer, placing each layer at a different angle from the prior one, so the tips are in different orientations. Decorate the edges with berries and slice. I’m getting hungry for some again. Time to make another one. Slice the pandora cake horizontally, in six or seven layers. Make a simple syrup by heating the water and sugar together until the sugar dissolves. Let the syrup cool, then divide in two and put the sambuca in one half, and the rum in the second half. Make the box of instant, mixing it with only 2 cups of milk instead of the 3 cups per instructions on the box. Whip the 1 cup of cream until soft peaks, then fold the whipping cream into the instant pudding. Drizzle some of the simple syrup on each layer of the cake, following by some of the pudding/whipped cream mixture. Continue with the rest of the layers, pivoting each slice so that the points are arranged in a star-like fashion. 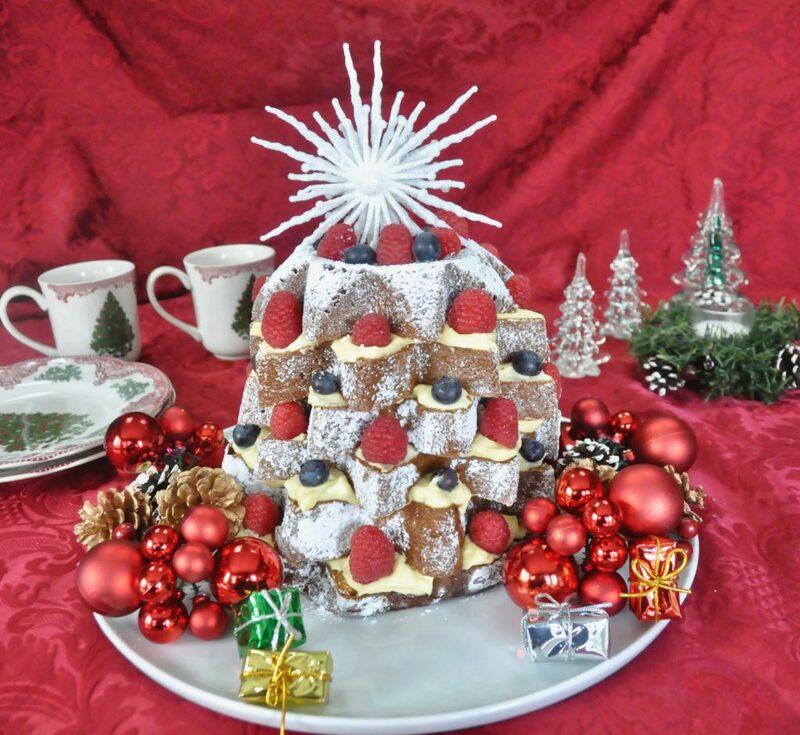 Finish by sprinkling with powdered sugar, and decorating the tips with berries. Optional, find a nice star at a craft shop for the very top. 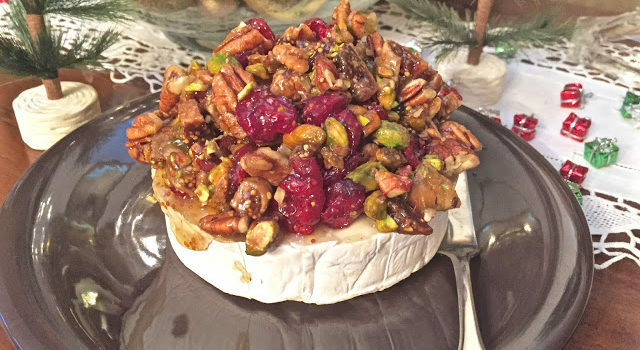 Last year, a baked brie similar to the one in the photo above made an appearance at some point during the holidays – purchased at The Scone Pony in Spring Lake, NJ, a shop selling outstanding scones and other treats. But the store’s limited opening hours didn’t correspond with my availability to stop in this year, so I decided to make my own for Christmas eve. I’ve got a few vegetarians in the family and the octopus salad, baccala mantecato and shrimp platter just doesn’t cut it with them. I couldn’t leave them out while we were sitting around embibing on prosecco and appetizers. The baked brie was a snap to make and was just as good as Scone Pony’s – no, better, since it was freshly made. Maybe you’re having guests at some point in the week, or making merry for New Year’s Eve. This would be a perfect accompaniment to those glasses of bubbly you’re likely to pour. 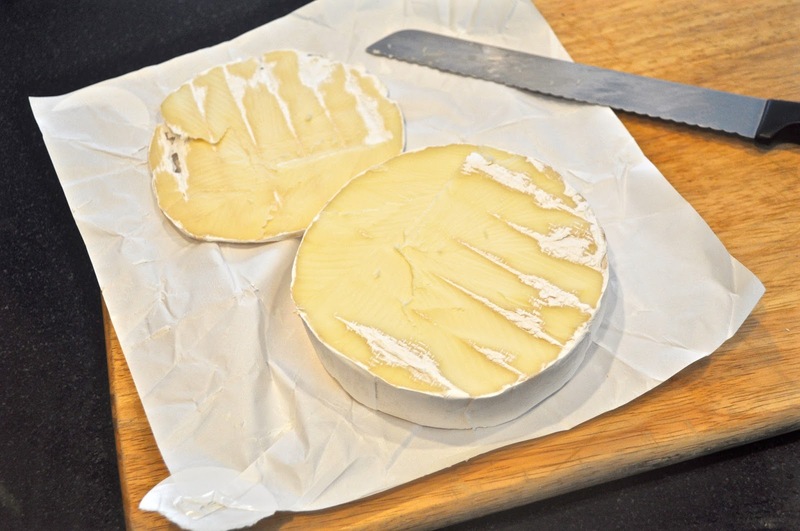 I start by slicing off the rind from a wheel of brie, an optional step, but it makes it a lot easier to dig into the cheese without the rind. 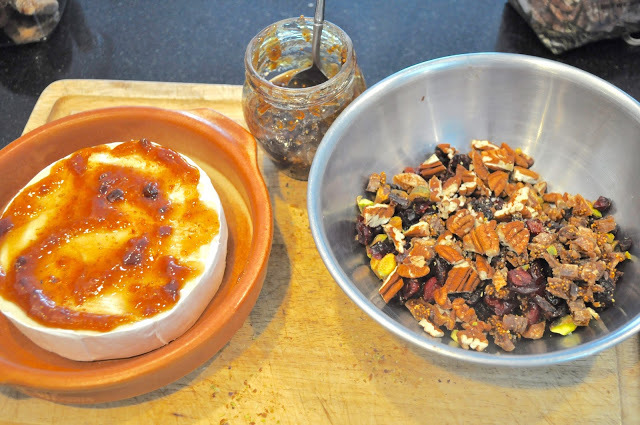 Then smear the top with a fig spread, fig preserves or other type of jam, jelly or preserves that you like. I know I’d also love this with either quince jelly, apricot or orange preserves too. Then take some of the same flavor of preserves or jelly and mix it with your choice of chopped nuts and dried fruits. 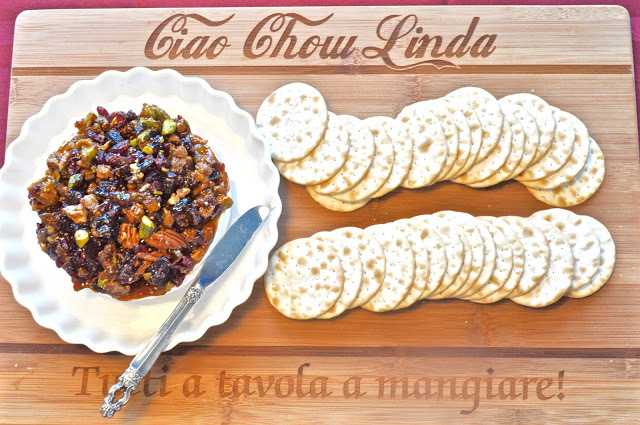 I used dried figs, cranberries and cherries, with pecans and pistachios. 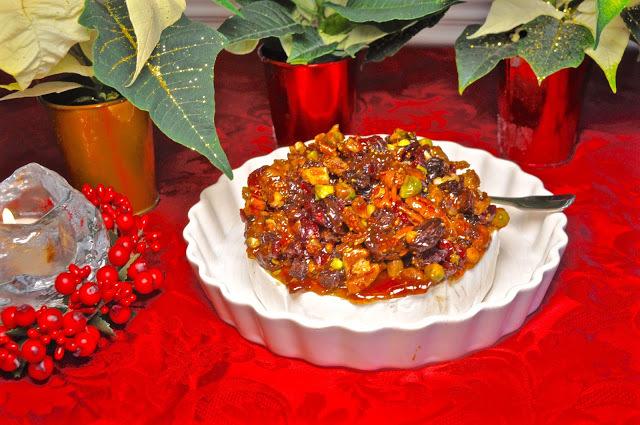 Pile the dried fruit and nut mixture on top, then when guests arrive, bake in the oven briefly or place in the microwave for a minute or two. Add some crackers and serve. Buon Anno and a big thank you to all my readers for following me this year, for leaving comments on the blog, for making my recipes and for emailing me with questions, or just to send greetings. 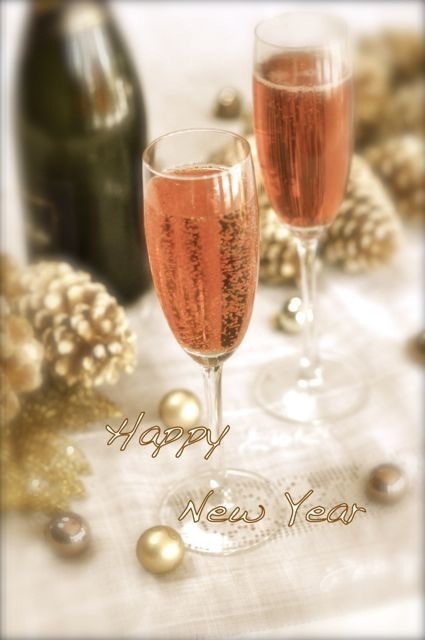 I wish you all the very best in 2016. Are you a social media devotee? Ciao Chow Linda is also on Instagram, as well as Facebook, Twitter and Pinterest. Click here to connect with me on Facebook, here for my Pinterest page, here for my Twitter feed and here for my Instagram page to see more of what I’m cooking up each day. All amounts are all approximate. Use as much or as little as you like of nuts and dried fruits. If you have too much, it keeps well in the refrigerator. 1/4 cup fig preserves, plus more for smearing on top of cheese. Carefully slice the top rind of the brie cheese, trying not to take much of the cheese. A little bit of rind on top is ok. Spread some fig preserves over the cheese. 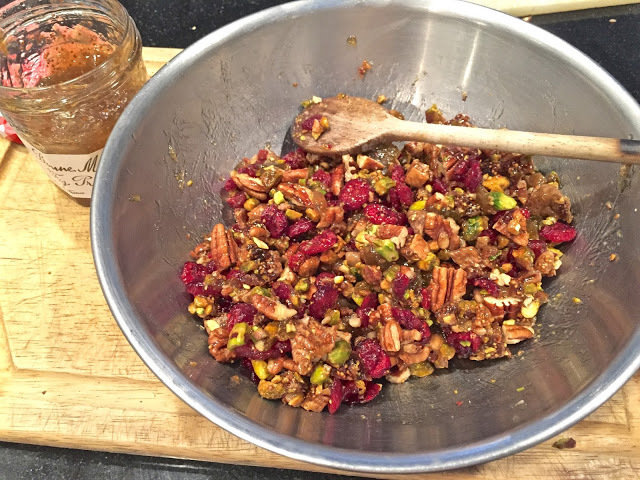 Chop the nuts and fruits, mix in the preserves and pile on top. Refrigerate until ready to use, then bake in a 350 degree oven for five minutes, or place in the microwave for one minute. You don’t want to melt the cheese, just soften it. Serve with crackers. We don’t serve rib roast for Easter but I made one last weekend when our kids came home and we celebrated both of their birthdays. 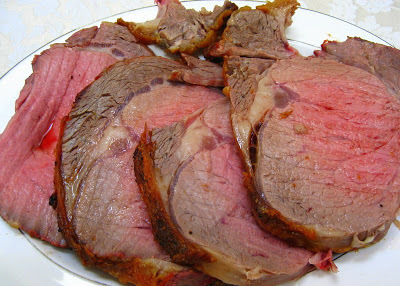 I thought I’d post the recipe for those of you who might be choosing rib roast for your Easter dinner over the more traditional lamb or ham. While it can be expensive if you don’t buy it on sale, a standing rib roast is always impressive (when properly cooked) and it’s a snap to make too. This was my first attempt at making Yorkshire Pudding, the typical accompaniment to rib roast. 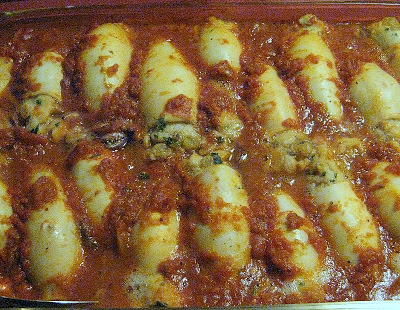 It too was easy to prepare and a big hit with everyone. 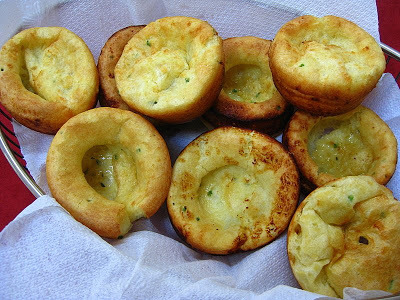 Long after we were sated with enough roast, we sat around sipping our wine and munching on these little popovers studded with herbs. Yorkshire pudding isn’t really a pudding as you can see, but more of a bread made with a thick batter that’s poured into muffin tins greased with beef drippings. You can use butter if you prefer. Either way, it’s not as fattening as it sounds since you use only a small amount of fat for each portion. Once you get the meat into the oven, mix up the batter for the Yorkshire puddings and refrigerate. After the roast is cooked and resting, pour the batter into the muffin tins and bake. For the rib roast, I used Ina Garten’s recipe with some modification. Her recipe calls for a 7 to 8 pound standing rib roast. Since I was cooking one that weighed only 3.5 pounds (more than enough for four people and we had leftovers too), I eliminated the last step where you kick up the temperature to 450 degrees. Just make sure to keep checking with a meat thermometer and roast it to the degree of doneness you like. When the meat reaches 125 degrees, for me that’s perfect and I take it out of the oven. The cooking continues even while it rests on the countertop. During the time it’s resting, I put the Yorkshire pudding into the oven. When they come out about 20 minutes later, the medium-rare roast is ready to slice and eat. Rub the meat all over with the salt and the pepper. Two hours before roasting, remove from refrigerator and let it come to room temperature (I let mine sit out for only one hour, but I had a smaller roast). Place the rib roast in a roasting pan in a 500 degree preheated oven. Roast it for 45 minutes, then reduce temperature to 325 degrees and roast for another 30 minutes. Test with a meat thermometer for the required doneness. If you’re cooking a small roast, as I did, it may be done. I took mine out of the oven at about 125 degrees. For a larger roast, check the temperature. If it’s not done yet, boost the oven temperature back up to 450 degrees and roast for another 15 to 30 minutes. Take the meat out of the oven and let it sit, covered with aluminum foil, for at least 15 – 20 minutes before slicing. Combine flour, chives, thyme and salt. Whisk milk and eggs. Add to the flour and herb mixture. Refrigerate while the roast cooks. Spoon a little bit of melted butter or beef drippings into the bottom of each of about 12 muffin tins. Tip the tins to coat. Pour the batter into the individual cups, about 1/2 to 2/3 full. Bake in a 450 degree preheated oven for 15 to 20 minutes. 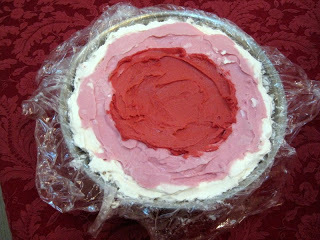 This is what I normally prepare for Christmas Day dessert, but this year I chose to make a Raspberry Bombe instead. As tasty as the bombe was, I have to say I missed the buche. The yule-log was missing from our yule. So I took the opportunity to make it for a post-Hanukkah party this weekend. It doesn’t have to be a holiday treat. It is sensational for any large, winter gathering, with shredded coconut strewn for snow and little meringue mushrooms sprouting up around the log. r up your courage and go for it. Make sure you read the directions thoroughly before starting. If you really mess it up, you can throw it all in a glass bowl and call it a trifle. 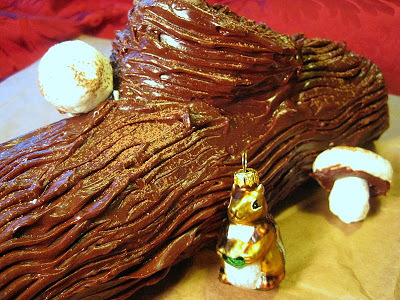 If you don’t tell anyone it was supposed to be a yule log, they’ll never know. This cake tastes best served at room temperature. 1. Preheat oven to 400 degrees. Spray a 12 x 17 inch rimmed baking sheet with nonstick cooking spray, cover pan bottom with parchment paper and spray parchment with nonstick cooking spray. Dust surface with flour and tap out excess. 2. Bring some water to a simmer in a small saucepan over medium heat. Combine chocolate, butter and water in small heatproof bowl and cover tightly with plastic wrap. Set bowl over pan, reduce heat to medium low and heat until butter is almost completely melted and chocolate pieces are glossy and fully melted. Do not stir or let water boil under chocolate. Remove bowl from pan, unwrap and stir until smooth and glossy. 3. While chocolate is melting, sift 1/4 cup cocoa, flour and salt together into small bowl and set aside. 4. In bowl of standing mixer fitted with whisk attachment, beat whites and cream of tartar at medium speed until foamy, about 30 seconds. With mixer running, add about 1 t. sugar; continue beating until soft peaks form, about 40 seconds. Gradually add half of sugar and beat until whites are glossy and hold stiff peaks when whisk is lifted, about 1 minute longer. Do not over beat. If whites look dry and granular, they are over beaten. Remove whites into a large bowl. bout 8 minutes. Add vanilla and beat to combine, scraping down bowl once. 6. Stir chocolate mixture into yolks, a small amount at a time so you don’t scramble the eggs. 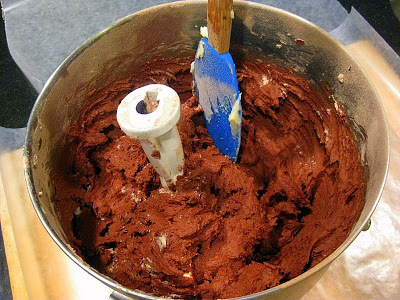 With a rubber spatula, stir one quarter of the whites into the chocolate mixture to lighten it. Fold remaining whites until almost no streaks remain. Sprinkle dry ingredients over top and fold in quickly but gently. 7. Pour batter into prepared pan, smoothing batter into pan corners. Bake until center of cake springs back when touched with finger, 8 to 10 minutes, rotating pan halfway through baking. Cool in pan on wire rack for 5 minutes. ocoa into towel. Run paring knife around perimeter of baking sheet to loosen cake. 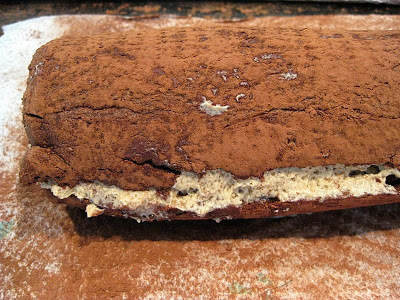 Invert cake onto paper towels and peel off parchment. This is tricky and it’s entirely possible that the cake will crack when you’re inverting it, or rolling it, as it did for me. Don’t worry if this happens. 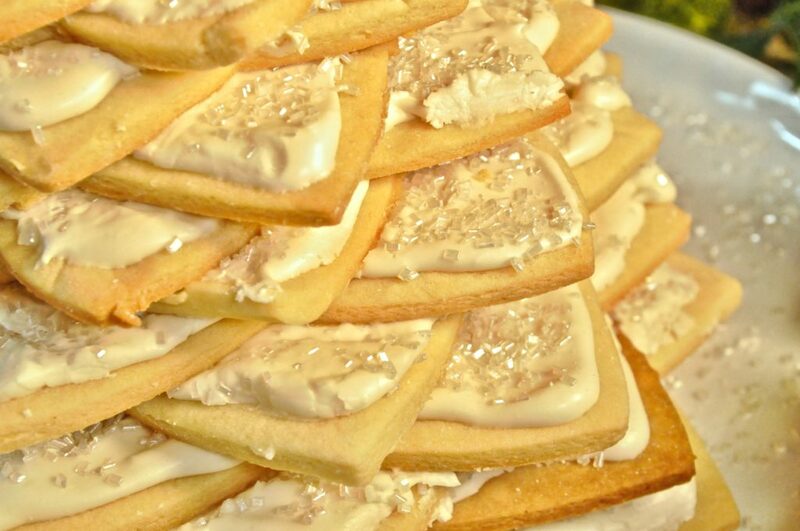 It can be covered with frosting. 9. Roll cake, paper towels and all, into jelly roll shape. Cool for 15 minutes, then unroll cake and paper towels. Spread filling over surface of cake, almost to edges. 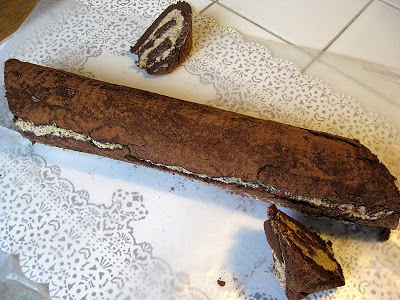 Roll up cake gently but snugly around filling. 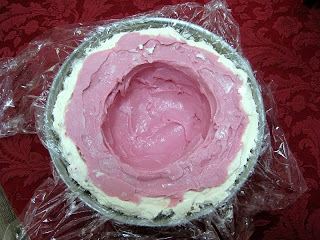 Put cake seam-side down on top and place in refrigerator for an hour to harden the filling a bit. This will make it easier to frost. gerator and trim ends at a diagonal. 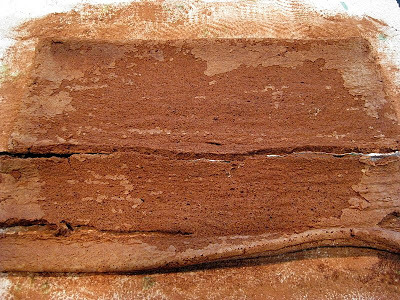 Spread ganache frosting on cake, including exposed edges. Take the edges that you trimmed off and attach to the top of the log as little stumps, using a long wooden skewer to help prevent them from sliding off. Spread more ganache on the little stumps reserving a teaspoonful for later. 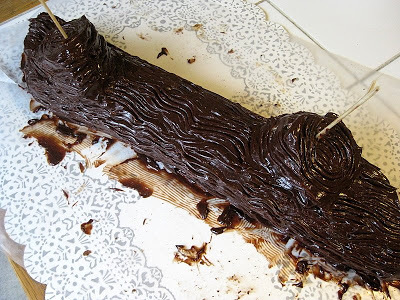 Use a fork to make wood-grain striations on the surface of the ganache before the icing has set. Refrigerate uncovered. Before serving, remove wooden skewers and patch the hole with a little dab of some frosting. Bring to room temperature before serving, for best flavor. 1. Simmer cream in a small saucepan over high heat. Remove from heat and stir in espresso powder and powdered sugar. Cool. 2. With spatula, beat mascarpone in medium bowl until softened. Gently whisk in cooled cream mixture until combined. Microwave cream and butter in measuring cup on high until bubbling, about 1 1/2 minutes. Place chocolate in bowl of food processor fitted with steel blade. 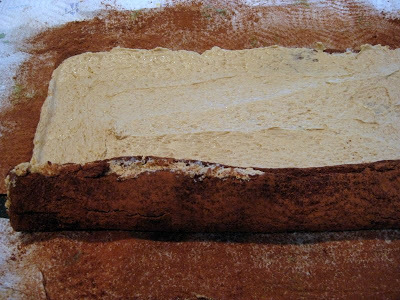 With machine running, gradually add hot cream and cognac through feed tube and process until smooth and thickened, about 3 minutes. Transfer ganache to medium bowl and let stand at room temperature for one hour, until spreadable. Beat egg whites until frothy. Add cream of tartar and sugar, gradually, until mixture forms stiff peaks. Place into a plastic bag and trim off a bit at the corner. Or use a pastry bag. Pipe onto a parchment-lined cookie sheet, some in small cap shapes and some in long “stem” shapes. Dab the tops with water to smooth out any pointy tips. Bake at 200 degrees for 1 1/2 hours, then turn off the oven and leave in the oven another 1/2 hour. Let cool. Before serving cake, cut little holes in the bottom of a cap shaped piece and push a stem shaped piece into it. You can frost the bottom of the cap first if you like, but be aware that these will soften quickly once you frost them. Don’t assemble the mushrooms until you are ready to serve the cake. When all the mushrooms are placed around the cake, dust the caps and the cake with more cocoa, for a “dirt” effect. For years we celebrated Christmas dinner with my friend Jan and her family. 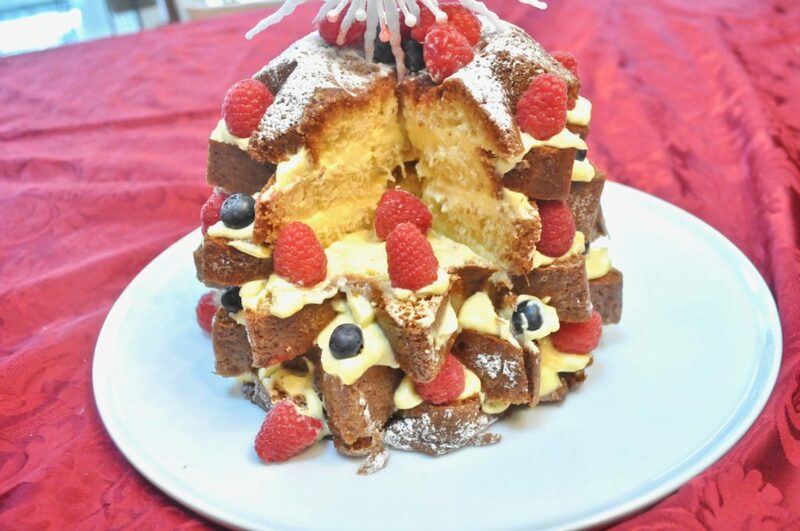 Jan would always prepare this bombe for dessert, while I made a chocolate yule log. When I was thinking about what to serve my large family clan for dessert after our traditional Christmas Eve fish dinner, this bombe naturally came to mind. It’s refreshing, it’s light, it’s colorful and it can be made ahead of time. Plus there’s no baking involved. It’s as easy as scooping sorbet into a bowl. 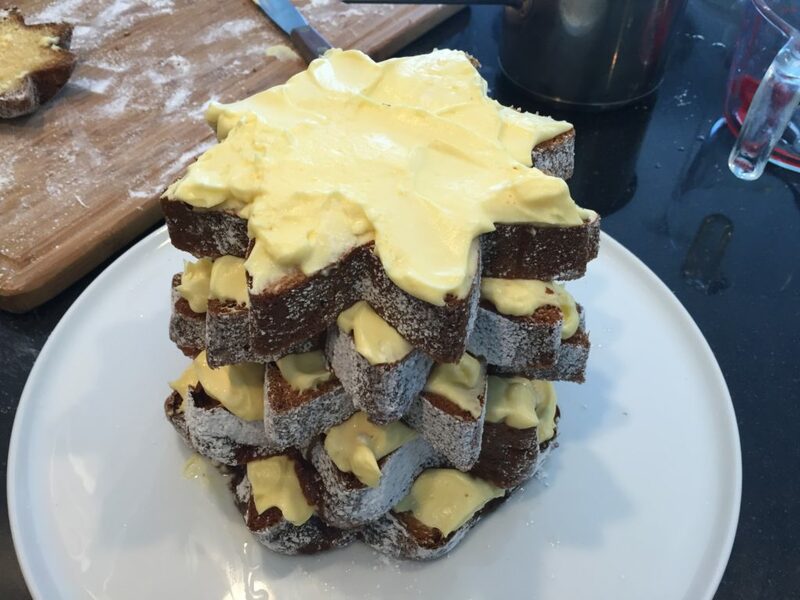 You don’t have to wait for Christmas to make this though. I’ve served it at dinner parties and it’s always a hit. Plus it can serve a big crowd with no last minute fuss. n the original recipe doesn’t fill the entire bowl. So I bought another type of sorbet and filled the rest of the cavity with that. I think I’ll make it this way each time, since the contrasting colors of the sorbet makes it look even more festive. You don’t have to fuss with the whipped cream piping on the top either. You can simply turn it out from the bowl and pour the raspberry sauce on top. 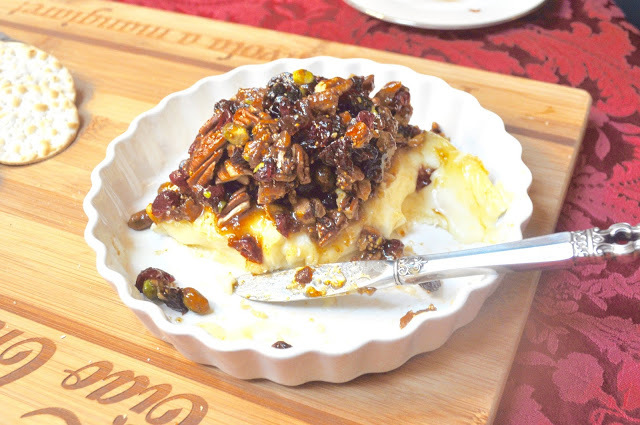 One other variation I make from the original recipe is to use candied walnuts rather than plain ones. It’s a versatile recipe you can alter any number of ways – using pecans, almonds, or pistachio nuts – or using ice cream instead of sorbet. Be creative and come up with something of your own. I’d love to hear how you customize it. Make the candied walnuts ahead of time by taking 1/2 cup sugar and 2 tsp. water. Melt the sugar in a nonstick pan, add the water and bring to boil. Add the walnuts, stirring and cooking together for about 5 minutes at high heat, until the mixture starts to turn light tan and the sugar starts to coat the walnuts. Remove from heat and spread on waxed paper until cool. Whip the cream with the sugar and vanilla. Add the candied walnuts and sliced cherries. Line a two-quart bowl with plastic wrap. Line the bowl with the whipped cream mixture, leaving the center hollow. Freeze for several hours or overnight. r with saran wrap and place back in freezer. 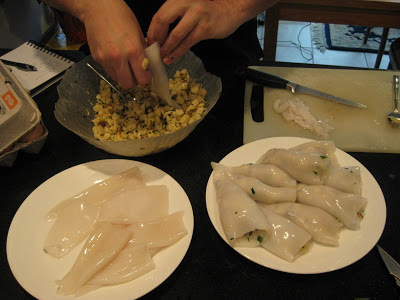 After several hours in the freezer, serve by turning upside down onto a plate and removing the plastic wrap. Serve with raspberry sauce. About an hour or two before guests arrive, whip up one pint of heavy cream with 3 T. confectioner’s sugar. 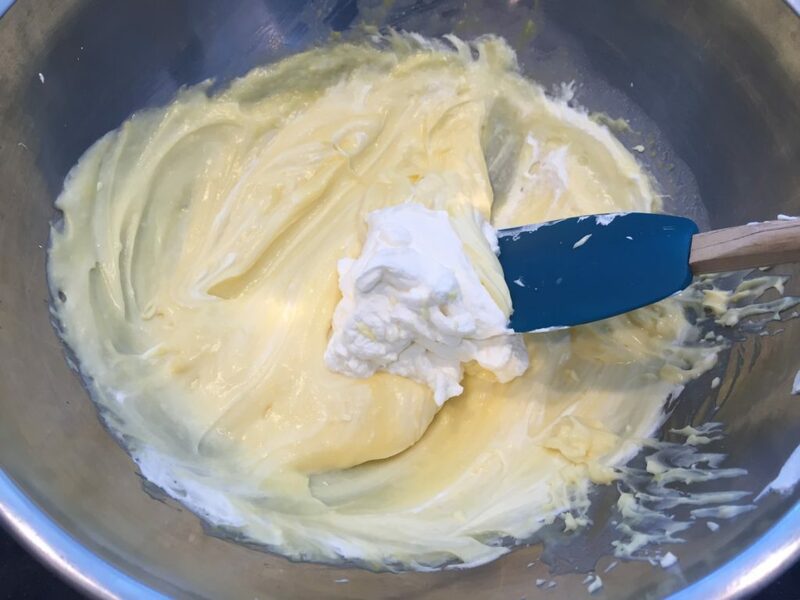 Whip until you get firm peaks, but not so firm that the cream turns to butter. Place whipped cream in a piping bag, or a plastic bag fitted with a large piping tip at one corner that has been snipped. Remove the bombe from the freezer and turn over onto a serving plate. 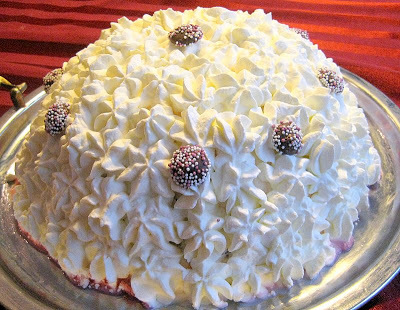 Pipe rosettes of whipped cream over entire bombe. Place it back in the freezer as is, with no plastic covering on top. Otherwise, you will smash the pretty rosette design. Don’t leave it like this for more than a couple or three hours in the freezer though, or you may get ice crystals forming on the bombe. Decorate with candied violets or small non-pareils. Serve with raspberry sauce. Boil together one 10- or 12-ounce package of frozen raspberries, 2 T. water and 1/4 cup sugar. Boil for about five minutes, then force through a strainer. Add 1 tsp. lemon juice and refrigerate. er wasn’t happy, to put it mildly. Since my mother died more than 20 years ago, and my mother-in-law only a year later, the mantle passed to me to maintain the tradition. I have shifted away from the fried fish that used to be the mainstay of the meal, but can’t give up the squid. My mother used to prepare it as the centerpiece of her meal, delicately simmering the rings in tomato sauce and serving it over pasta. It was always a favorite. 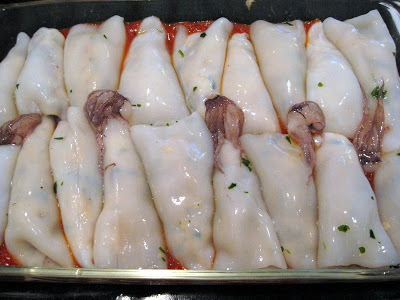 But my husband is partial to this stuffed squid recipe which his mother always made, and which my son now makes every year, as part of our multi-fish dinner. It’s also a great complement to the seafood risotto I prepare, with the tomato sauce from the squid spilling onto the saffron-flavored rice in the risotto. I’ll be sharing that recipe with you too shortly. 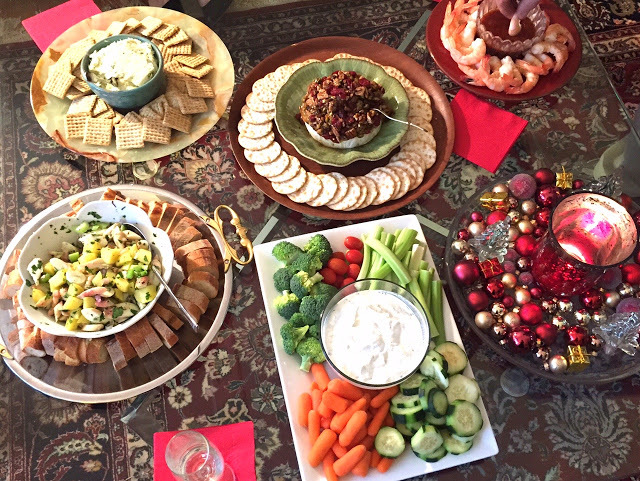 Although it’s too late to cook these dishes for this year’s Christmas eve, maybe you can start your own tradition next year. Buy the squid already cleaned, but rinse them under water and remove any cartilage that still might be left in the body. It will pull out easily and look like a strip of milky, translucent plastic. If you want, trim the wide end of the squid for a more even look. Place the olive oil in a large pot, and add the onions and carrots. Saute until soft, then add the garlic and saute a couple more minutes. Break up the whole tomatoes with your fingers, or using a food processor, but leave some texture. Do not break them up so much that the sauce becomes smooth. We like it with some tomato lumps in it. Add the tomatoes and tomato puree to the pot, along with the wine, salt, pepper, basil and red pepper flakes. Simmer on low heat for about one hour. otham Bar and Grill. Portale’s relatives hail from Sicily – just across the straits of Messina from Calabria. Bingo! Except for a few ingredients, the recipe sounded just like the cookie I remembered, only better. This one added a cup of apricot jam, which my mother’s recipe didn’t, and I think it helps keep the cookies moist, as well as adding flavor. 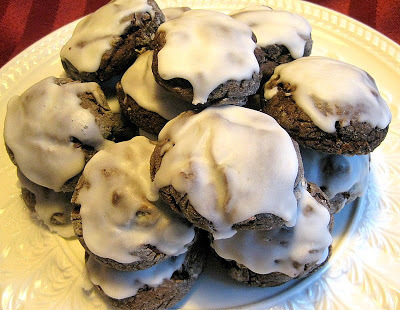 You can add walnuts and raisins to the cookies if you like, as Portale did, but I leave them out, since they were never included in my mother’s version. She did however add chocolate chips – a nod to her new found country, I suppose. And of course, her recipe calls for that unusual addition of black pepper. It adds even more complexity to the flavor – and some mystery too. I wouldn’t dream of making the cookies without it. 1. In a large mixing bowl, combine flour, cocoa, baking powder, cinnamon, nutmeg, cloves, salt, black pepper. Combine and set aside. 3. 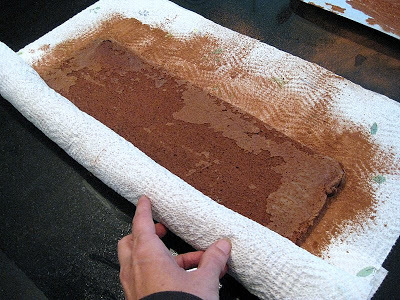 Place a large piece of waxed paper or parchment paper on the counter and flour it generously. Take a large spoon and scoop out a couple of heaping cups of the stiff batter onto the floured surface. Use a spoon to release it if needed. Flour your hands well and begin to shape the batter into a log shape, about an inch in diameter, rolling it back and forth on the floured surface. Use the paper to help mold it. 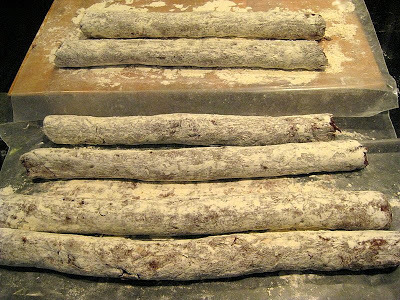 Place the “logs” into the refrigerator for a couple of hours. 4. Remove from refrigerator and cut into sections about 1 1/2 inches wide. You can leave it this shape, or roll it between the palms of your hand into a flattened ball, which is the traditional shape. 5. 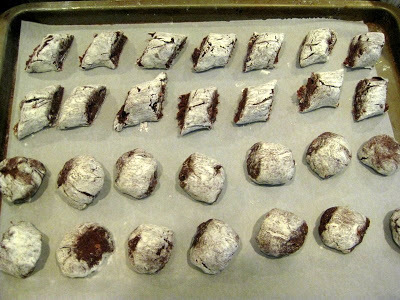 Place balls on a parchment-lined or greased and floured cookie sheet, about 1 inch apart. Bake for about 10 minutes at 350 degrees. The tops will crack – this is normal. Transfer cookies to a rack and let cool. Cover with the glaze when completely cooled. Mix sifted confectioner’s sugar and lemon juice with a spoon until the desired consistency. I make mine almost like a frosting rather than a glaze, which means you’ll need to add more sugar. If you prefer yours to be more of a drizzle, adjust with more lemon juice. 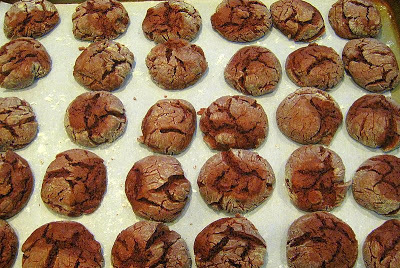 This recipe makes about 6 to 7 dozen cookies and they freeze well. Just make sure the glaze is dry before putting them in the freezer. They will get hard if you leave them at for more than a week.